A lot has been happening here at Team Al headquarters these last few months! Between the link love I’ve gotten at Mark’s Daily Apple, being featured on Ross Training and my recent article on Sherdog, lots of new visitors have been stopping by – not to mention all the people who’ve found their way here through fans and friends sharing posts on facebook and twitter (thanks guys!). Bootcamp at Tompkins Square Park has also been going great and I’ve been staying busy working with my personal training clients (not to mention my own, personal training). In the months ahead, look for new articles on a variety of topics including injuries and injury prevention, muscle-ups and – everyone’s favorite – the human flag! I’m also planning a new front lever tutorial and more posts on nutrition. Love it bro. Such an inspiration. Been great watching your human flag progression. Def gives me hope. Is that an Al original score in the first video too? And yes, I wrote and performed the music in both videos. Glad you enjoyed! That was Awesome. I can’t wait to be able to do half of the things you can. Thanks, Kevin! Be patient and keep training hard! 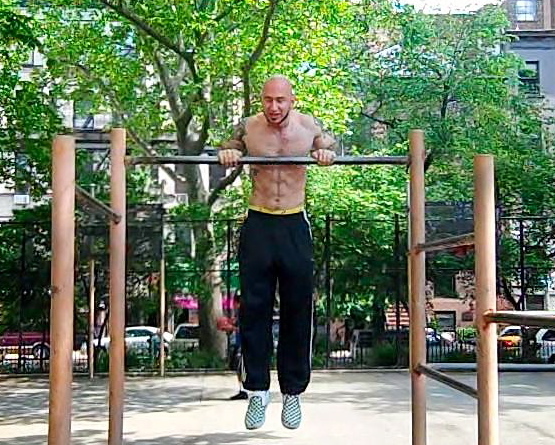 More post on front lever tutorial!!! Is your book available at the local bookstore or do I have to order it online? For now, my book is only available through the website and at a few independent shops in NYC. Keep on plankin’! I’m looking forward to your future videos and topics. I’m interested in how you approach training for clients who have physical limitations and can’t perform a full range of motion and/or certain exercises. For me I have shoulder issues that preclude some exercises. Bro- I followed you over here from Marks page (gun5ling3r), you are what I aspire to be. Why didnt I see you on American Ninja Warrior kid??!! I am going to read your site in its entirety and then most likely bombard you with questions/advice!! Well done my friend. Thanks! There is a lot of content here to keep you busy for a while – Enjoy!